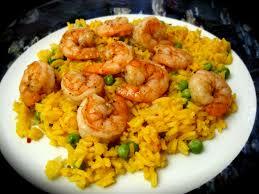 Arroz Amarillo con Camarones y Vegetales Mixtos - Yellow Rice with Shrimp and Mixed Vegetables - Tienditadepuertorico.com - Buy Puertorican Food Here!! 1 more minute. Add the boiling liquid and seasonings. Cook until the water has evaporated. Stir, lower the heat, and cook for 20 more minutes, stirring after 10 minutes. 2 Note: If you want rice with a spicier touch, increase the amount of curry powder.